Molded fans are often produced from nylon and are typically one-piece construction. 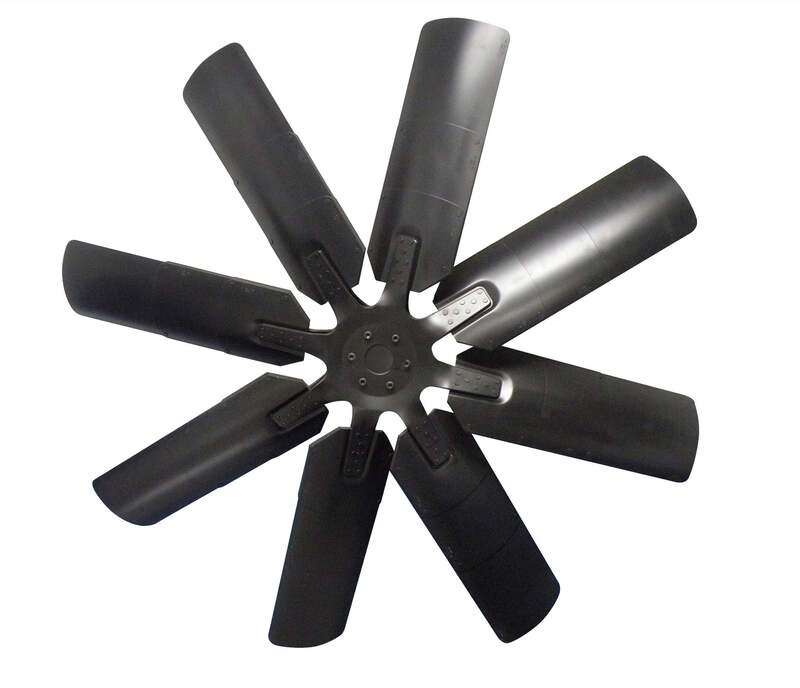 Molded fans are common in both on- and off-highway markets. These include medium- and heavy-duty truck, bus, vocational vehicle, agriculture, construction, power generation and specialty. Given how molded fans are designed and then manufactured, they can be used in a variety of applications. Design characteristics such as noise, weight, strength, airflow and deflection can be tweaked to achieve desired performance. 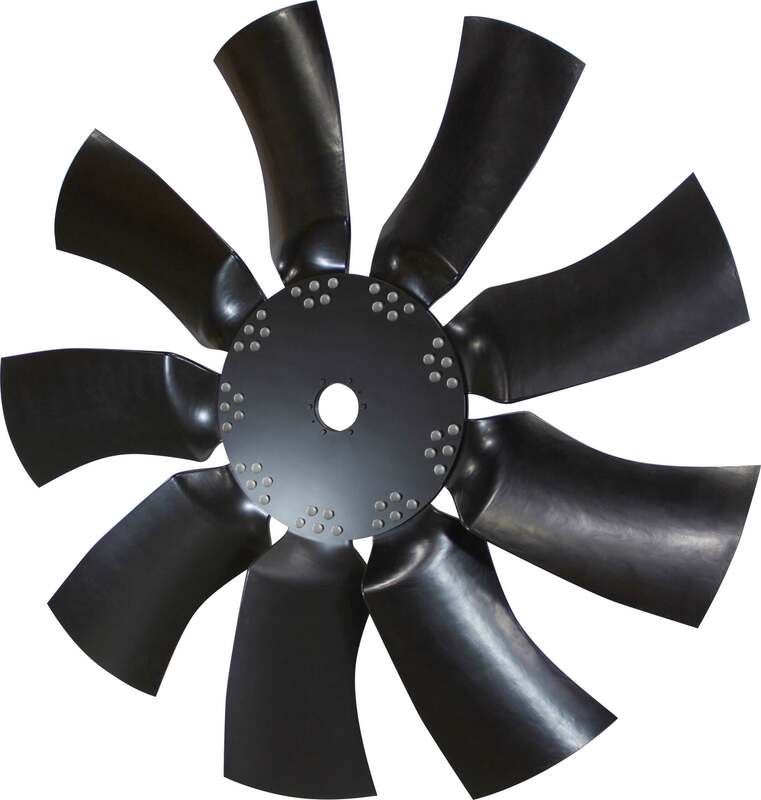 Modular engine cooling fans are noted for design flexibility and are often ideal for the off-highway markets such as agriculture, construction, industrial and specialty. Modular speaks to the various types of blades (pitch, style, rotation, length, number) that can be attached to the hub and how they are attached. They typically allow for optimizing performance but also faster and easier testing and prototyping. The Horton thermoset composite (HTEC) fan, however, falls into the modular category too. A Horton HTEC (thermoset composite) fan offers strength and durability like steel but is impervious to rust and more efficient. It’s perfect for mining applications where fan damage from rock hits is common. An HTEC fan is also more efficient than steel because the blade design can be optimized. It can produce more air movement with less parasitic loss — again a good choice for mining trucks where extra horsepower means more productivity. They’re quieter than metal fans, too. Metal cooling fans offer the advantage of being highly customizable. They are available in a range of blade configurations in either steel or aluminum. They are intended primarily for off-highway use, including mining equipment, construction equipment, generators, compressors, refrigeration units and agricultural equipment. Their use also extends to some on-highway applications. Metal fans offer the advantage of strength and so deflect less to achieve targeted air flows. 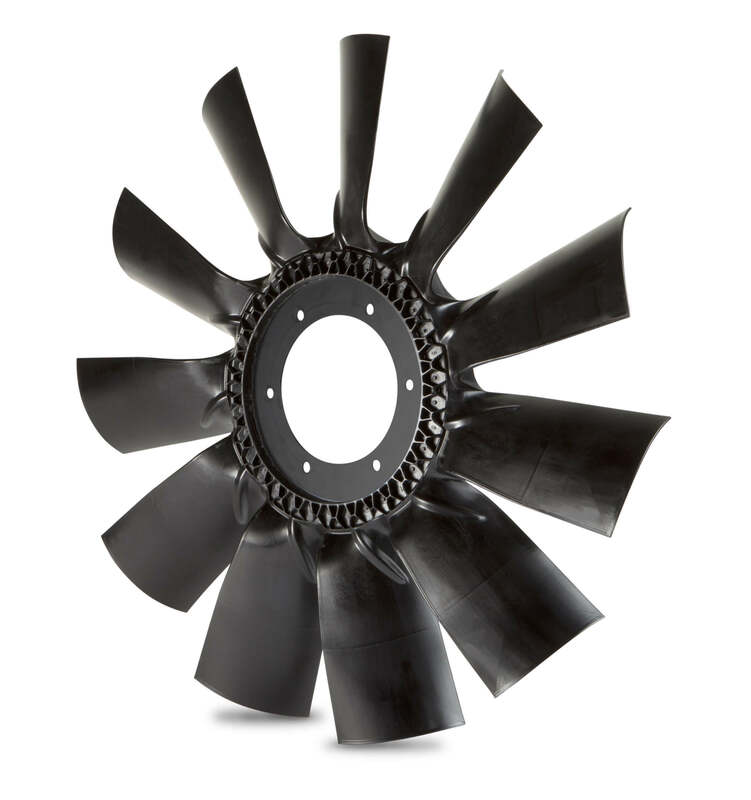 The Horton fans feature riveted construction and no welded components to increase service life. They can also be coated to resist the effects of caustic environments. Optional flair tip blades provide better cooling and closer tip tolerances. Horton offers a wide variety of metal as well as molded fans including the HS9, HS11, MS8, MS9, LS11, HEHF and Ring-style. Several modular fans are also available and include the Windshift series, the Shogun series, the HTEC 1800 and 2500 and many composite nylon fans.